DAVID HUTT. Timor-Leste developing closer ties with China. Southeast Asia’s newest and poorest nation needs funds that Beijing is poised to provide to fuel what some see as Dili’s misguided oil and gas ambitions. This article was published by Asia Times on the 2nd of November 2018. Timor-Leste, Southeast Asia’s newest and poorest nation, is slowly but surely drawing closer to China, a move that is raising antenna among its allies and neighbors and initial concerns it could fall into a potential Chinese debt trap. Timor-Leste’s closest regional partners are still Australia and its ex-colonizer Indonesia, but the small nation now imports US$160 million worth of goods from China and Hong Kong – more than any other country apart from Indonesia. Dili has also recently contracted Chinese firms to build major infrastructure projects, including a national high-voltage electric grid and highways in the country’s south. In 2017, the China Harbor Engineering Company was subcontracted to build a large container port at Tibar Bay. China has also provided the funds to build new modern offices for Timor-Leste’s ministries of foreign affairs and defense, the presidential palace and its defense force. Those investments have caused certain political ripples. Former president Jose Ramos-Horta has lambasted “certain writings by academics or journalists” for being “extremely inaccurate and misleading” in characterizing China’s growing influence in Timor-Leste. “It’s a cliché and it’s silly,” he told the South China Morning Post in September, while appearing to contradict himself by saying Beijing needs to do more to help his country. “As we cannot continue just issuing diplomatic statements on how good relations are, China also has to take some steps forward in looking at how it can more qualitatively support Timor-Leste’s development,” Ramos-Horta said. China was the first country to open diplomatic relations with Timor-Leste when it achieved independence in 2002. It was also one of the few countries that tried to provide money and arms to the independence forces that fought against Indonesian occupiers from 1975 onwards. “Australia has provided more aid and development assistance to Timor-Leste than China, so in some sense Ramos-Horta is right that China’s ties to Timor-Leste have been exaggerated in some quarters,” says Bec Strating, a lecturer in politics at La Trobe University in Melbourne. Timor-Leste is coming out of a year of political uncertainty after last year’s general election returned a minority government that crumbled when it couldn’t pass its program in parliament. That led to fresh elections in May, won by the Change for Progress Alliance (AMP) coalition. No one expects China to suddenly become Timor-Leste’s chief ally; that designation will remain with its historic partners, Australia and Indonesia. But relations with Australia are flagging, providing a potential opening for Beijing. Ties took a hit on revelations that former Australian foreign minister Alexander Downer ordered the bugging of Timor-Leste’s Cabinet office in 2004. The bugging was thought to give the Australian resources company, Woodside, the upper hand in negotiations over oil rights. Moreover, some in Dili are now raising questions about the terms of Australia’s financial assistance. Timor-Leste may soon need such loans for its crucial oil and gas sector. For years, progress has stalled on planned extraction in the Timor Sea because influential political leaders in Dili want the processing to be done on-shore at its under-construction Tasi Mane project. Roughly US$250 million has already been spent on the project, including a new airport and highway, notably built by Chinese state contractor China Overseas Engineering Group. Companies in the Greater Sunrise consortium, which includes ConocoPhillips and Woodside, oppose Dili’s proposed on-shore processing. Instead, they want it to be done either on a floating platform at sea or in Australia, both of which they argue would be cheaper and more efficient. In September, Timor-Leste’s new government signed a preliminary agreement to buy ConocoPhillips’ 30% stake in the Greater Sunrise gas consortium. Since ConocoPhillips owns the gas-processing plant in Darwin, in northern Australia, where the syndicate wants to process the extracted oil and gas, this could tip the deal in favor of on-shore processing in Timor-Leste. However, the deal has yet to go through and the other members of the consortium can now also try to acquire ConocoPhillips’ shares. 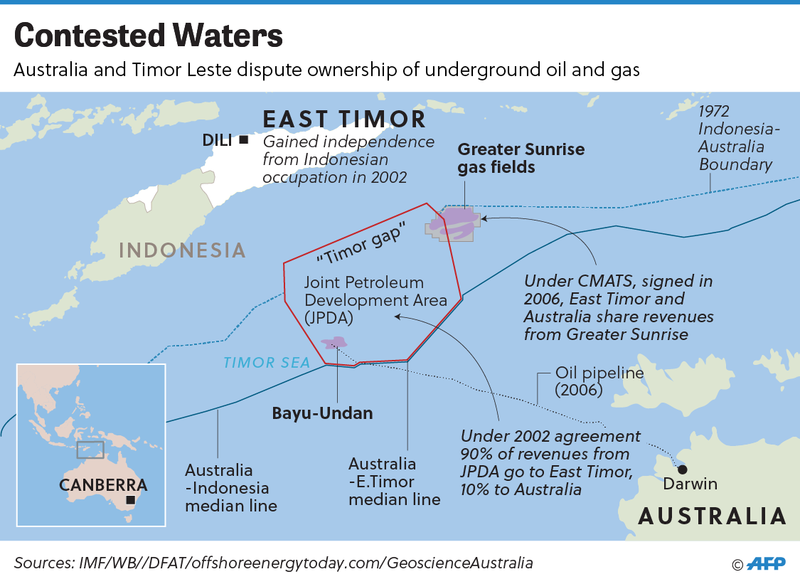 If Timor-Leste purchases the stake, which would be managed by its national oil company, TimorGap, then the country will receive 30% of the profit from gas sales on top of the revenues it gets for extraction in its maritime territory. However, it would also be expected to pay 30% of the consortium’s capital expense for the development, which could cost several billions of dollars. That’s on top of the costs for the Tasi Mane project, which could also run into the billions of dollars. Timor-Leste’s 2019 state budget is currently being debated by parliament, but it is thought Prime Minister Taur Matan Ruak plans to set aside US$5 billion from the Petroleum Fund, the country’s sovereign wealth fund, for such purposes. There is roughly US$17 billion left in the fund, but growing state budgets are quickly depleting it while the country’s current source of oil and gas revenues from the Bayu-Undan reserves are set to run out in 2022. “It will cost upwards of US$10 billion to construct major projects envisioned by some political leaders, especially those related to the Greater Sunrise and Tasi Mane,” says Charles Scheiner of the local NGO La’o Hamutuk. “Many international financial institutions doubt the viability of these projects and are reluctant to finance them,” he adds. One option, analysts say, would be to appeal to China for concessional loans. “There have been persistent rumors of Timor-Leste turning to China for funding for the Tasi Mane project if the majority of its costs are not shared by consortium partners,” says Damien Kingsbury, professor of international politics at Australia’s Deakin University. “It seems unlikely the consortium partners would be interested in putting serious money behind a project that continues to have more questions than answers associated with it,” he said. To be sure, there is no concrete evidence that Beijing is interested in financing the projects. However, Timor-Leste’s government is now trying to pass reforms that would make such Chinese investments easier. In 2016, China and Timor-Leste signed a US$50 million loan agreement from the Export-Import Bank of China to rehabilitate Dili’s drainage system. “China does not come to help, but to cooperate with East Timor as an equal partner in the development of East Timor,” China’s ambassador to Timor-Leste, Liu Hongyang, said at the signing ceremony. But the deal was finally rejected by Timor-Leste’s Audit Court, which is responsible for government oversight. Now, however, documents reviewed by Asia Times appear to show that the government wants to amend the 2005 Petroleum Activities Law to limit the Audit Court’s ability to review contracts relating to petroleum operations – a move that would potentially allow for more Chinese financing in the Tasi Mane project. In April 2017, Timor-Leste was granted prospective membership to the Asian Infrastructure Investment Bank, a Beijing-based development bank, that could be a conduit for such loans, analysts say. Another area in which Chinese investment might play a much larger role in Timor-Leste’s development is in funding infrastructure for its budding tourism sector, which has been prioritized by the new government. The Macau News Agency reported earlier this year that negotiations are underway to establish an airline connection between Timor-Leste and Guangzhou in southern China. Currently, there are only direct flights to Dili’s airport from Bali, Singapore and Darwin. Several Macau-based firms, including Charlestrong Engineering Technology and Consulting Ltd, are building housing and resorts in Timor-Leste’s special region of Oecusse. There are also persistent rumors that Ina Chan Un Chan, a prominent Macau-based businesswoman and wife of Macau’s casino tycoon Stanley Ho Hung Sun, is interested in investing in Timor-Leste’s tourism sector. Some believe that Timor-Leste’s relations with China are being directed not through Beijing but rather Macau, a Special Administrative Region of China that was Portuguese territory until 1999. As another former Portuguese colony in Asia, Timor-Leste takes part in numerous multilateral events hosted by Macau; Beijing uses Macau to host its economic cooperation forums with the Lusophone world. Ramos-Horta may be right in saying that China’s leverage over Timor-Leste is exaggerated, but that doesn’t mean the situation couldn’t change if Dili is in desperate need of concessional loans. And China, which is fast becoming the region’s banker, would likely be happy to oblige. 4 Responses to DAVID HUTT. Timor-Leste developing closer ties with China. The concern remains, Jakarta still has supporters, and the issue of Communism was still able to mobile people across generations in 2006. Disinformation planted by Gusmao, so easily peddled by an uncritical media. Gusmao was never going to honour CMATS. It was just a tool for him to pursue his greatest and ongoing obsession – the destruction of Alkatiri. Gusmao uses his proxies, then burns them. If they lie down and take it he may pay them off handsomely. Some end up dead. Collaery and ‘K’ have become Gusmao’s useful idiots. He’s had plenty of those. From the start of UNTAET Gusmao’s attitude toward Alkatiri was ‘I’ll just let him fail, I won’t raise a finger to help.’ As it became apparent that Fretilin would win the election, Gusmao changed his position. He and others including the Catholic Church were convinced Fretilin would win, gain access to Petroleum money and use it as patronage to win future elections. Gusmao determined the election should be stopped, Fretilin deposed, broken up into smaller parties and their votes stolen, even at the risk of ET becoming a failed State. Gusmao and his proxies were certain Australia and the UN would rebuild the destruction they’d wrought. This is the background to the CMATS negotiations. Macau? Lisbon used to send it’s troublemakers to Timor. Timorese troublemakers were sent to Africa. Now they go to Indonesia and China. After Salsinha surrendered [it was a close thing and could have ended in more tragedy] Reinado’s chief strategist F.Dom.Soares aka Padre Maubere was sent to Lisbon and Macau via Vatican ratlines to avoid prosecutions of clergy and to protect the coup plotters. China must have an awful lot of Kompromat. Gusmao will take money from wherever he can, without the slightest intention of paying it back, promises will be reneged on. When you’re in debt to creditors just burn down the market [or your country], blame others, demand the International community wipes your debt and rebuilds for you. Not the first time he’s done it. China will be cautious about risking big money for either commercial or strategic investment in ET, even if they have the signatures of leaders. I cannot believe our DFAT people didn’t foresee this coming, surely they raised this prospect to the pollies? Is this yet another case where the “Game of Mates” was played against the good advice of the civil service? Now Scomo is trying to regain form with his Pacific development bank idea; sounds like too little, too late. Well, good for Timor-Leste. The country is merely exercising its sovereign right to do business with whomsoever it might wish. China is no less a partner in the development assistance game than Australia is–or Japan, or South Korea, or India or, God forbid, the distant high priced US of A or even Victorian New Zealand. Far too many foreign journalists have this “thing” about China–that it is some kind of a Loch Ness monster with sinister intentions. If China has sinister intentions so does Australia, and New Zealand, and Japan, and South Korea and Taiwan and, especially the US. David Hutt’s piece has strands of neocolonialist paternalism. Grow up buddy. Stop it, old chap, the Opium Wars are a thing of the past …. well, perhaps, may be not. It was of course fear of China that was the cause of the Indonesian intervention in 1975. Interesting? I am surprised you do not mention Portugal as a coloniser seeing as how it was a Portuguese colony for 400 years. Their religion is a Portuguese legacy and the elite speak Portuguese as their first language and have imposed it as a national language. The very name of the country is based on Portuguese. Fretilin’s name and ideology was based on Portugal’s African colonies.